The Roughnecks bounced back in a big way with a 15-12 win over the Vancouver Stealth in front of 9,708 fans at the Scotiabank Saddledome on Friday. Just six days after dropping their season opener 17-6 on the road to the Rochester Knighthawks, the Roughnecks (1-1) jumped out to early leads of 2-0 and 5-2 over the Stealth. Curtis Dickson led the way with a three goals and three assists, while Holden Cattoni had a natural hat trick in the first quarter to get things rolling for the Riggers before adding an assist in the final frame. Riley Loewen also had a hat trick to go with a pair helpers, while Dane Dobbie and Tyler Digby each scored once and set up three others. Also getting in on the action were Wesley Berg (1g, 2a), Mitch Wilde (1g, 1a), Tyson Bell (1g, 1a) and Zach Currier (1g). Suiting up for his 100th career NLL game, goalie Frank Scigliano made 51 saves to pick up the win in the net for the ’Necks. Logan Schuss led the way offensively with five goals and three assists for the Stealth (0-2), while Brandon Clelland scored twice and set up two others. James Rahe, Tony Malcom, Joel McCready, Ryan Fournier and Rhys Duch also scored for Vancouver. Tye Belanger started in net for the Stealth and stopped seven of 11 shots he faced before being relieved by Brodie MacDonald, who made 31 saves in a relief appearance. Loewen opened the scoring at 1:24 when he took a pass from Tyson Bell before driving hard to the net and snapping a quick shot past Belanger before his momentum caused him to do a somersault over the top of the net. Dobbie extended Calgary’s lead to 2-0 at 2:59 with an over-the-shoulder, behind-the-back shot that fooled Belanger. Rahe answered right back for the Stealth at 11:03 before Schuss scored 32 seconds later to pull Vancouver within two goals. Digby then picked the top corner over MacDonald’s left shoulder before Schuss completed his first-quarter hat trick with 31 seconds left on the clock. 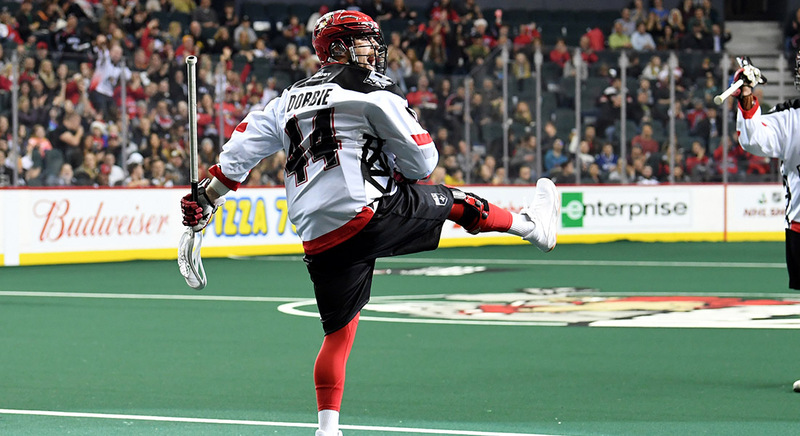 Although the Stealth had an extended two-man advantage early in the second quarter, it was the Riggers who scored to go ahead 7-4 as Dickson out-battled three Vancouver defenders before whipping a low shot past MacDonald. With the teams back playing five-on-five, Malcolm scored for the Stealth before Dickson notched his second of the contest at 9:13 when he whipped a shot to the top corner over MacDonald’s left shoulder once again. Just 29 seconds later, Clelland scored in transition to pull the Stealth back within two goals. After Schuss scored his fourth of the game 48 seconds into the third quarter, Wilde replied with a nice heads-up play when he scooped up a loose ball in the slot before turning and firing a shot past MacDonald. McCready then scored for Vancouver before Loewen and Currier tallied goals 11 seconds apart to put the Riggers up 11-8. Fournier pulled the Stealth back within two before Berg leapt high in the air to catch a rebound while firing the ball into the top corner behind MacDonald in the same motion. Bell scored another shorthanded goal for the ’Necks before Loewen completed his hat trick to give the home side a 14-9 lead through three quarters of play. Vancouver outscored Calgary 3-1 in the fourth quarter, but it was too little, too late for the visitors. The Roughnecks now have two weeks to prepare for their next game on Friday, Dec. 29 when they’ll host the Colorado Mammoth at the ’Dome.